WOW, we just had a great weekend for weather in the Chicago-land area which reminds me that it is time for my annual vitamin D reminder so here it is; be sure to GET YOUR VITAMIN D! If your check the tags in this blog you should be able to find a number of posts on the importance of vitamin D in our health. I believe I cannot ever stop informing patients on the importance of vitamin D because it is that vital to human health and function. When I read this recent study, combined with the great sunny weekend, I decided it was time for another vitamin D post. This study is new, published online April 6, 2016, so it is hot off the presses so to speak. The study is titled; Serum 25-Hydroxyvitamin D Concentrations ≥40 ng/ml Are Associated with >65% Lower Cancer Risk: Pooled Analysis of Randomized Trial and Prospective Cohort Study. What a title, eh? Basically this paper is saying that when blood vitamin D levels are over 40 ng/ml there is a 65% lower cancer risk for all invasive cancers. The authors studied data from two large cohorts made up of women aged 55 years and older without a cancer diagnosis prior to enrollment in each study. The author of the Lappe cohort authored a previous paper which found a 77% decrease in risk for all cancers in women aged 55 or older who took 1000 IU of vitamin D per day. The current study is free to view here but it is full of statistical analysis, that is difficult to understand unless you are into that sort of thing. It is a great study, though, and worth the time to at least pursue to help shore up your understanding on the importance of vitamin D.
I recommend at least 2000 IU a day, in this study the authors find that 4000 IU a day is the number to reduce cancer risk. In reality you need to get the vitamin D level in your blood checked, if your vitamin D level is very low take the higher dose and recheck for a couple of months and recheck it again. If the level rises above this 40ng/ml drop your daily does to that 2000 IU and check it again in several months to make sure you are maintaining that level. It is smart to get some professional help in managing your vitamin D levels, what is presented here is merely an outline for you and your physician to follow. You can also get your vitamin D from UV light, it is a bit more complicated, but it might be more efficient than taking an oral supplement according to some. We don’t currently check blood Vitamin d levels but it has been something we have been contemplating doing because vitamin D levels are proving to be very important to our health. What if I told you, you could reduce your cancer risk by 65% by taking a tiny daily supplement? That sounds like a no brainier, right? Despite something so easy, we continue to see about 75% of the US population as vitamin D deficient. Vitamin D deficiency is a big health problem and can put you at risk for a number of health issues, including cancer. 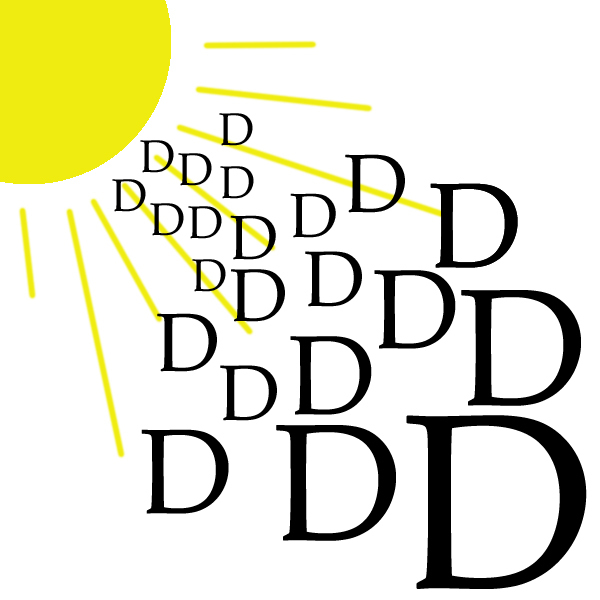 Take you vitamin d supplement and then get out in the sun for a few minutes to get a little extra D for good measure. If you have any questions let us know, we would be happy to help in any way we can.